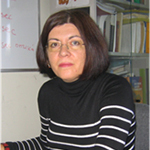 Ioanna Zergioti is an Associate Professor at the National Technical University of Athens, School of Applied Mathematics and Physical Sciences. She studied Physics at the University of Crete and she received PhD at the FORTH. After her PhD, she worked as a post doctoral researcher in the MPI in Göttingen. Then, she worked as a post-doctoral researcher in the Philips CFT until 2000. She was a researcher until 2003 at IESL – FORTH. Since September 2003 she was appointed at the NTUA. Her main activities are related to the laser materials processing for electronics and biomedical applications. She has co-authored more than 80 publications in international refereed journals, 90 publications in conference proceedings, 4 chapter in scientific books, 3 granted Greek patents, 1 European patent. She has co-organised large conferences such as CLEO, EMRS, COLA conferences. She is currently coordinating two European Research projects, a Marie Curie IAPP “LaserMicroFab” and an ICT “BIOFOS”. BIOFOS aims to develop a simple, fast, low-cost, sensitive, portable and reliable, screening tool for in-situ detection of food contaminations in nuts, olive oil and milk and also for the quantitative detection of lactose in milk. In this aspect, BIOFOS combines the most promising concepts from the photonic, biological, nanochemical and fluidic parts of Lab-on-a-Chip (LoC) systems, aiming to achieve low sensitivity and high specificity, excellent reliability and compactness. BIOFOS relies on the ultra-low loss TriPleX photonic platform in order to integrate, on a single chip, 7 micro-ring resonators, a VCSEL and Si photodiodes, and achieve a record detection limit in the change of the refractive index of 5•10-7 RIU. Targeting to a reusable and compact device, BIOFOS relies on the use of aptameric sequences as bio-recognition elements of the sensor, where advanced surface functionalization techniques are used for their immobilization. Results on the design and fabrication of the photonic structures and immobilization and regeneration of the aptamers will be discussed in this conference.